No, I don’t mean eat tacos every day. Although I am sure my kids would be fine with that. Everything is better in moderation, even tacos. My friend got this kitchen towel for me and I love it. 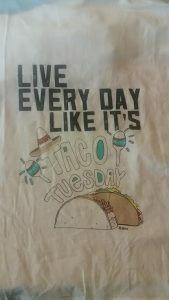 I think the wisdom of the towel is meant to be this: Taco Tuesday is a celebration and you should celebrate something every day. A sentiment I wholeheartedly agree with. BUT to me, this means something different and much more practical….. Always know what you’re having for dinner. It’s so simple, yet so time and sanity saving. Always know what you’re having for dinner. There are a few reasons why. First, there’s no guess work when you walk in the door at 6pm and everyone’s hungry and whiny. Second, if you’re trying to eat a balance of food groups and nutrients you can know in advance what you’ll be eating that evening so that the rest of the day can fill in the blanks. Third, you’re more likely to eat a healthy dinner if it is planned in advance, the ingredients are in the fridge and you’ve made time to cook it. I plan dinners two weeks in advance and we stick to the plan as much as possible. I do it this way because I am experimenting with only one “big” grocery shopping trip per month, with smaller trips on the other weeks. I am giving this a shot to see if I actually spend less money this way. So far, it seems to be working. There are some days that we feel like something else, or we have more leftovers than expected we’ll go rogue and deviate from the plan. This has not been often. This requires some organization and planning time, which I typically do on Friday mornings because that’s my “clean my house and organize everybody’s life” time. Along with saving money, I also am saving time. If the plan is done, I don’t have to spend time and energy deciding what to cook or figuring out what I need to buy on a more regular basis. If meal planning seems like an overwhelming chore it doesn’t have to be, read my blog post here for some super easy tips. If it still seems overwhelming, don’t stress yourself out. Take it a day or two at a time. Each day when you eat dinner, think of what you’ll be having the next day. Get anything out of the freezer that needs to defrost, make a note if you have to stop at the store the next day, do anything else that you can do in advance that will make the next day easier.